For any group, making it past the first album is an accomplishment. For any super group, making it past the first album is almost miraculous. Besides coordinating disparate styles and schedules, just making good music is a challenge; especially when a group’s members are already famous in their own right. 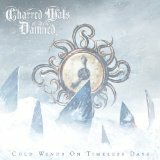 Charred Walls Of The Damned manages to pull this off on their second full-length, Cold Winds On Timeless Days. Produced by guitarist Suecof, Cold Winds manages to blend production styles as well as its musical styles. The drums are precise and clean, but not sterile, while the guitars are lush, but not overbearing. The bass is clear and present, yet still rich, and Ripper’s penchant for multiple vocal layers is perfectly captured. In short, it’s a masterful blend of power and death metal. With their spotless track record, Charred Walls Of The Damned should be making great music for years to come. Fans of fine musicianship will not want to miss this. As well, folks who enjoyed the past works of any one of the group’s members should check this out. And, of course, if you like the heavier side of metal, this is the record for you.